Gainesville, an appealing city in Florida’s central north, set world headlines on fire in 2011 when Terry Jones, pastor of the Dove World Outreach Centre, a small nondenominational Christian church, threatened to burn copies of the Koran. Charismatic Christians aside, a trip to Gainesville is not a trip into the heartland of the American right wing. It is, however, an easy trip from Orlando and a city hailed by many of one of the best places to live in North America. Those visitors who do travel the 112 miles north from Orlando will discover a city that offers a winning combination of inexpensive cultural attractions, easy opportunities to encounter Florida’s rich outdoors and a slice of the Sunshine State’s historical charm at its most authentic. Gainesville is home to one of America’s largest universities – the University of Florida – and the city’s main cultural attractions focus around the university’s Cultural Plaza. At its heart stands the Florida Museum of Natural History whose first class permanent exhibits transport visitors on a journey through Neolithic history, diverse ecology and native species. The star exhibit is the Wall of Wings – a showcase of thousands of specimens of butterflies and moths. While the adjacent Harn Museum of Art is “dedicated to promoting the power of the arts to inspire and educate people and enrich their lives” and houses world class collections of African, Asian and contemporary art and photography. Born and raised in Gainesville, Tom Petty once worked as a grounds man at the university and fans still gravitate towards the ogeechee lime near Phelps Laboratory – planted by the man himself and known today as the “Tom Petty Tree’. The morbidly inclined also pay homage to Beaty Towers. According to a legend Petty denies, the suicide of a female student at this university residence was the inspiration behind the Heartbreaker’s classic American Girl. Gainesville promotes itself as the city where nature and culture meet and the first stop for any nature seeking tourist has to be the Morningside Nature Center on the east side of town. Here deep, towering longleaf pine woodlands are home to the Living History Museum which faithfully recreates south Florida farming life late 19th century style, complete with historic breeds and freshly baked cookies. For a walk on Florida’s wild side, head ten miles south to the Paynes Prairie Preserve State Park a sweeping 21,000-acre nature preserve where wild horses, deer, bison and the ubiquitous alligator roam. Closer to downtown, the Kanapaha Botanical Gardens offer a labyrinth of exotic gardens, abundant wildlife and meandering trails alongside the unlikely highlight of giant lily pads. Attractions aside, Gainesville’s sedate downtown oozes old fashioned charm and pristine restoration, which the student population enlivens with an upbeat vibe. This vibe has strong links back to the 1960s and East Coast hippy culture. To indulge in a flavour of Gainesville’s hippy heart, which still faintly beats beneath its historic downtown, head to Satchel’s where “every pizza is a work of art”. More a way of life than a restaurant, Satchel’s invites visitors to explore Lightnin’ Salvage – the onsite junk museum – before savouring the best pizza in town inside an old camper van. 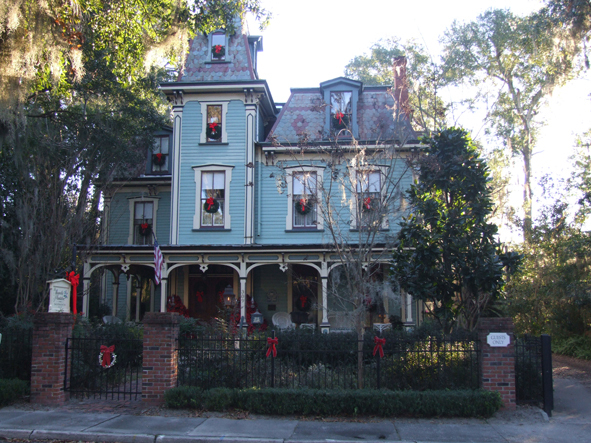 Or take time to chat with Joe and Cindy Montalto, owners of The Magnolia Plantation bed and breakfast, a rambling French Second Empire mansion nestled deep within Gainesville’s hushed back streets. Twenty years ago the Montaltos painstakingly restored this dignified beauty to the prime that years of hippy habitation had stripped away. According to the Montaltos, middle aged women with nostalgia in their eyes are known to come calling, all seeking a glimpse into one of the mansion’s many rooms where years ago they kissed their virginities goodbye. It’s a genuine shame that many visitors to Florida never discover Gainesville. Anyone who does take time to explore beyond the state’s theme parks and beaches will discover that Gainesville has far more to shout about than a headline grabbing pastor would have us believe. The mile-long Solar Walk on Gainesville’s NW 8th Avenue features monuments to the planets in the solar system. All are made from recycled materials and show the planets to scale both in size and distance from the sun. Tags: Florida, Gainesville | Permalink.